Thereafter, each year on the 4th we had 50+ parents and kids spread out on the big sloping lawn under the oak tree – kids atop the the pony in the corral, riding Betsy’s Misty in the fields, competing in gunny sack races, distance seed spitting and other challenging activities organized by our pied piper, Nan Brewer. Late afternoon, the best food from every family was on the hay wagon – until dusk when Bill hooked up the tractor to roam the farm. There were just two anxious times I’ll never forget. One, when Dolly, the irascible pony, knocked young Cam Brewer off her back causing a severe elbow fracture. (He is now a fine Dr. himself, with, I trust, a strong arm.) The other happened when our youngest son, Gunnar, was nowhere to be found until someone spied him sitting on the highest peak of the big barn. Years of 4ths have passed since the picture was taken. Five of us became widows, including my dear sister Judy whose husband Pat, sat next to Bill. 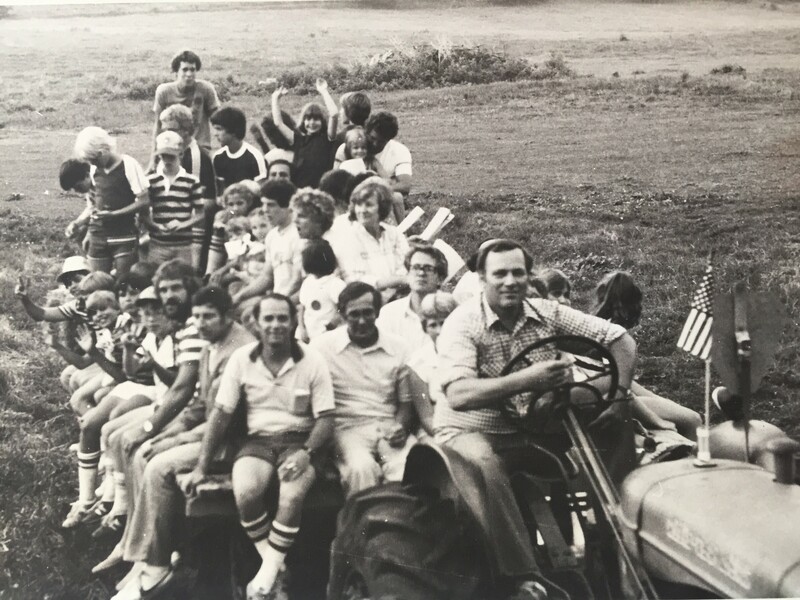 The boy standing at the back of the wagon is our oldest son, Bill, who spent many hours on that same wagon baling hay with his Dad. He and his wife, Sheila now have Molly, Emily and a young son, Brian – born on the 4th of July! I still pass the farm often. It is now a lovely subdivision; the restored homestead stands at the entrance and the big oak tree still shades the rolling lawn. Our friends are now proud grandparents and the children on the wagon are raising their own. I cherish the memories of each and every one of them – especially on the Fourth of July. Belated thanks for following my blog. It’s people like you who have created many of my best memories – and I know you’ve influenced many of the kids on the hay wagon! I enjoyed every word of this warm, happy, loving memoir. Such memories keep us company and make us feel loved even as we lose some of the participants. You bring past times alive, Susie. And what good times they were. A grand tradition. Thanks for this poignant remembrance, eloquently expressed. Susie thanks for sharing your beautiful memories. You have a wonderful way with words and I can just picture the whole event. What a lovely memory to share with us. The images are warm with lots of love. How life carried you all on to both troubles and blessings. Enjoy this 4th of July with your children and grandchildren!